You are currently browsing the Suburban Homesteading – Frugal Living blog archives for November, 2016. Pomegranates are the jewel of the fall fruit season. 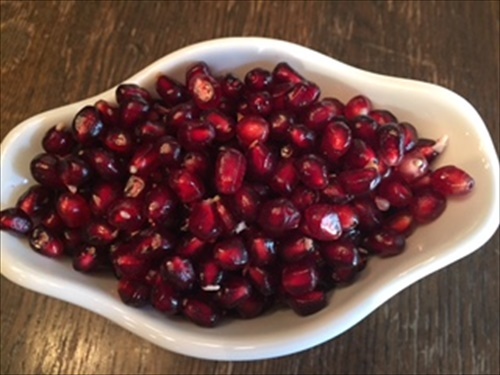 The ruby red seeds and tantalizing juice pair perfectly with dishes from salads to desserts to cocktails. But, they are notorious for being one of the messiest fruits to break into. As a child we would sit under an afternoon fall sky, peeling back the skin to expose the thin membrane before separating each quadrant to get to the seeds. We’d pop them into our mouths and crunch down to release the vibrant juice. I can’t tell you how many shirts were ruined or the number of times we had to scrub our hands to get the staining off. But, that was then. Now we have become much more adept at extracting the hundreds of tiny gem-like seeds that lie inside while keeping the greatest number intact. 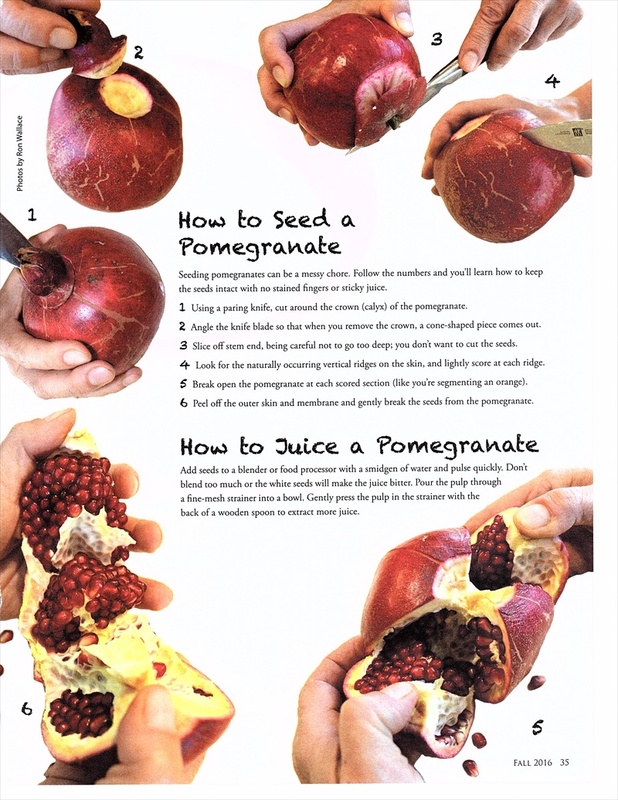 Follow the steps below, which I found in a local farm bureau magazine, and you will quickly be using fresh pom seeds, making juice or boiling it down to a thick sticky molasses that is perfect in a wide range of dishes. Pomegranates are not a primary crop in most areas of the U.S., they grow in small-acreage pockets across the warmer zones 8-10. Although there are hundreds of cultivars world-wide only about 14 grow in the States. They are very easy to grow and are quite productive once established in the right region. They can be grown like a dense shrub, trained as a tree, or heavily pruned in an espaliered form to fit into small gardens. Seeds range from a very dark ruby red to a lighter pinkish color depending on the variety. If interested in growing pomegranates, check with your local nurseryman for the best cultivar for your area. To freeze seeds: dry seeds with a paper towel before placing on cookie sheet covered with wax paper. Place in freezer for a few hours. Once frozen thay can be stored in a freezer container. To freeze juice: pour juice into a freezer container leaving about a ½-inch of head space. To make pomegranate molasses: pour juice into a heavy bottomed pot. Bring to a low boil over medium heat. Adjust to maintain boiling. In about 30-35 minutes the juice will take on a syrupy consistency and become bubblier. This is the point when the syrup begins to turn into molasses. Watch closely because the transition happens quickly. Use a spoon to test. Syrup will coat the spoon, while molasses will have a heavier coating. The whole process will take between 30 to 40 minutes, but closer to 40. Store finished molasses in an airtight container in a cool, dry place. I know, I know. We all have grandma’s best ever this or that, the tried and true family favorite, but this is seriously the best banana bread you’ll ever taste. And, it came about by shear accident. Let me explain. It was years ago. DD was still in grade school and bananas were a staple in our house. We used them in lunches, on oatmeal, dipped in chocolate as a sweet treat. Every week I would buy them and every week they were eaten in some fashion or another. Then, they fell out of favor as many foods do when you eat them insesately for weeks or months. They are no longer special, just part of the daily grind that is putting together meals or packing school lunches. When bananas were too soft for fresh eating I would make banana pancakes on the weekend to use them up, so they didn’t go to waste. Single moms can get very creative when they live on a budget and don’t want to waste food. But, this day was different. We had tired of banana pancakes, and not being a fan of banana cream pie I had to come up with another way to use the now spotted yellow and brown skinned tropical fruit. When no ideas came to mind I threw the now very ripe bananas in the freezer until I could come up with a plan. Then it happened. That ah ha moment when you find what you’re looking for without really even looking. I was flipping through a cookbook, looking for something completely different, and there it was, bold as day…a banana bread recipe for a holiday breakfast. I read over the recipe and mentally checked off the ingredients one at a time (it’s so nice having a well-stocked pantry). The recipe called for slightly softened fresh bananas, but I only had the one’s I had thrown in the freezer a few weeks earlier. What the heck, I’ll give it a try. I thawed the banana’s, reread the recipe, making a few adjustments, and the end result was a soft, moist, dark-colored nutty bread with the most intense banana flavor I had ever tasted. It was, in fact, the best banana bread I had ever tasted. So what makes this banana bread so different? My gastronomically uneducated opinion is…the sticky, sweet, intensely flavored syrup that is given off when the bananas defrost; that and the combination of brown sugar, applesauce instead of oil and the addition of pecans rather than walnuts. This recipe has become a fall favorite and is great toasted and slathered with butter, or even made into grilled French toast. Cream together butter, sugar, and eggs. Sift dry ingredients and combine with the butter mixture. Blend well. Add the bananas, applesauce, and vanilla; stir well, but don’t overwork the mixture. Stir in the nuts and pour into a well-buttered 9x5x3-inch loaf. Bake one hour, or until a knife inserted in the middle comes out clean. Turn out onto a rack to cool. Makes: 1 large loaf. TIPS: This is one of those full proof recipes. It’s had to screw it up, so be a little adventurous with it. I have used different kinds of applesauce from plain to chunky homemade to cinnamon. If you do try it with cinnamon applesauce, reduce the cinnamon in the recipe by half. 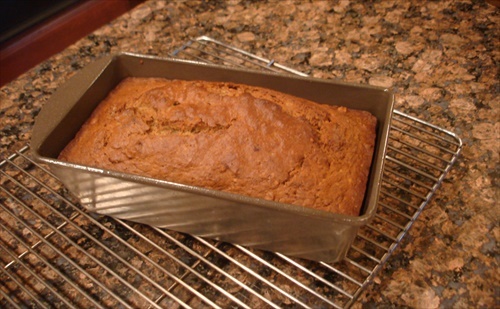 You can also use this recipe as a base for other quick breads like apple spice, apple butter, pumpkin or pumpkin butter. So many people romanticize farm life. They show pictures of fluffy day old chicks, frolicking lambs in lush green pastures, gallons of frothy milk warm fresh from the udder or homemade baked goods that would make even Julia Child jealous. What they rarely talk about is the other side of farm life, the side that is not always pretty and sometimes downright depressing and ugly. That part of farm life that bespeaks of failure or sadness or a job not so well done. I have farmed for many years, and have lived on my suburban homestead for many more, but it wasn’t until last night that I thought of myself as a failure, of someone who couldn’t get it all or keep it all together. It was late, as usual, and I was just getting home from work and making my evening rounds. 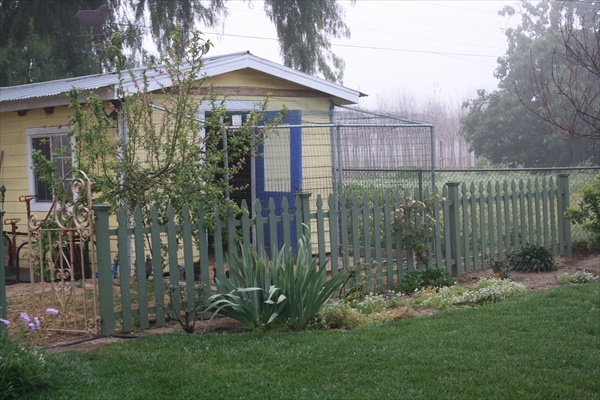 I was standing out near the barn looking out over my little farm; assessing the orchard, the garden, the barn and the chicken coop, when a rather profound thought came to my mind…”I am not very good at this anymore”, “I have become the worst homesteader ever”. I have a wonderful barn, one that has housed sheep for shows, rabbits & chickens for meat, and laying hens for eggs, but one that is in desperate need of cleaning and painting. I have a chicken coop with one hen. ONE! The others were picked off by a marauding opossum over the past few weeks. The one I have left is not even laying, so we are eggless to boot. I can’t stomach the idea of eating store bought eggs so we have gone without. My attempt at growing sweet potatoes in an unused water trough was an epic failure, and the weeds in my garden are more prolific than the vegetables. I did get a few spindly cabbages (that I fed to the chicken). I guess that’s something. My fruit trees have produced very little. A huge windstorm that followed the spring bloom blew off most of the blossoms and small fruit. I got two Fugi apples, barely enough for a rustic apple tart. My most productive haul was from an espaliered pear tree that I planted last year. I got about three dozen Asian pears that were absolutely divine. Overall, the year has not been good, which made me feel like the worst homesteader ever. I blog about homesteading on a suburban lot, but it’s pretty uninspiring when a homestead blogger has no chickens, no garden, and no produce. There have been years when our little farm has produced more than we can use…making me feel like I should get an award for small plot farming…And other years? Well, it’s all we could do to keep the animals alive, get to our shows, manage school and work, and put a few greens on the table. Thank God I’m not dependent on my farm for survival, or some years we’d be doomed. But here’s the thing…I couldn’t care less. I’m fine with good days and bad days; productive years and not so productive years because modern homesteading is more about the journey than the destination. Sure, I’d love spending ALL day tending my farm, digging in the garden or preserving the harvest, making quilts or cooking homemade meals, but that’s not realistic. Neither is spending every weekend working on the farm rather than living. We all have a life outside of our farm life, or at least we should. Enjoying a light lunch of fresh made chevre and home baked bread on a glorious fall day. The milk came from a friend’s dairy goats and was mixed with herbs from an herb garden planted just this summer. The bread makings are part of my well-stocked pantry. Transforming a paltry apple harvest into a delicious (and easy to make) rustic apple tart that was enjoyed following a roasted lamb dinner. The lamb was raised here and put in the freezer last year and the carrots for a Woodcutter’s Carrot side dish came from a local farmers market. Raising a farm kid who just graduated college and is pursuing her own independence while planning for a farm life of her own. Growing a friendship that not only provides a wonderful supportive relationship, but goat’s milk as well. My schedule doesn’t allow time for dairy animals (as much as I would like it to) so this is the next best thing. A fully stocked pantry that allows me to spend more of my free days homesteading and less time shopping in town. Over the years I’ve learned that not everything is sunshine and roses, not everything attempted is a success. Failure is a fact of life and you can either embrace it or be so afraid of it that you shy away from trying anything new or different. I don’t ever intend on being like that. I’m too curious a person to be daunted by the possibility of failing. Someone once said that, “you learn more by failing than by succeeding”. I think that’s true because when I fail I have the chance to pick myself up, dust myself off and try again. And, that’s exactly what I intend to do with my homestead—start again—like any good farmer would. I’m going to my local farm stand and buy myself some new hens. They order day old chicks in the spring, use them for educational purposes at the farm before selling them off in the fall so they don’t have to be cared for during the winter. It’s a great deal. I don’t have to brood them or grow them out until they are old enough to lay. They are laying already! I’m going to enlist some help and do a major garden clean-up; clearing weeds, fixing the raised beds, and installing a better watering system that won’t require me to spend hours each day with a hose in my hand. I’m already excited because there is nothing better than spending time in the greenhouse starting seeds, planting them out and watching the garden grow lush and green. I’m also going to renew my pumpkin patch because I truly miss those wonderful orange orbs peeking through their giant green leaves. I’ve always wanted a small flower bed outside my chicken coop and a load of free bricks I got a while back will be perfect for the edging. It will make a wonderful “bee friendly” flower bed near the fruit trees. The barn is getting a complete cleaning, top to bottom, well, top to dirt floor. The nesting boxes will be cleaned out, refilled and waiting for the arrival of the new hens, and I’ll make space to store all my long-handled gardening tools. My lists can sound daunting, but I’m excited about the opportunity to start afresh, shaking off the bad year and looking forward to all the possibilities of new successes. We’re not perfect, here. It’s nothing like a television show. Some years are wonderful and everything hums along beautifully, while other years are messy and epic failures. But, like I said, homesteading is a journey and not a destination. As long as I’m enjoying the journey and excited about renewed possibilities, my enthusiasm for living a farm life in the ‘burbs will not be dampened. So, not to worry folks, I’m not going anywhere. Rest assured you’ll be hearing about the whole beautiful, dirty, glorious, messy thing—the good, the bad, and the ugly. I stumbled across this, can’t remember where, but it spoke to my inner farm girl. “I used to admire fashionably dressed and impeccably groomed women. 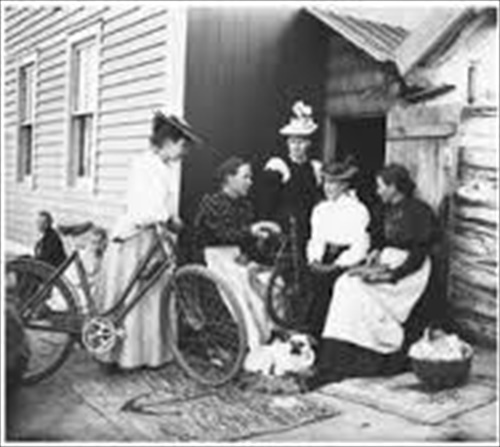 Now, when I see homely dressed women at the wheat and produce pick-up spots, I wonder what they could teach me about food preservation and living a more frugal life”.